Download Free Shapefile Maps – Shapefile is one of the most common and extensively use vector file format of GIS (Geographical Information System), developed by ESRI as an open Specification, which consist of collection of files viz .shp, .shx and .dbf extension with same prefix name. You might be hunting to Download free shapefile for completing either your small industrial work for POC or for academic project use or for any NGO work. Here you will find the links of best resources to Download Shapefile for free, either its polygon, polyline and point feature shapefile, covering different subjects like Administrative Area Boundaries, Roads, Railways, population etc across the world. You may also look to download Digital Terrain DEM. their respective terms and conditions, so please read T&C before using it for any purpose. Website is developed by Robert Hijmans, which provides free Shapefile to download, covering around 244 countries. You can directly select the country and category of shapefile and press on OK button to start download. Subject Category option you will find here are Administrative Areas (Boundaries), Inland Water, Roads, RailRoads, Elevation, Land cover, population, Climate and Gazetteer. GADM is a spatial database of Global Administrative Areas, which covers all countries data defining boundaries such as provinces, taluk, departments, counties, krong etc. GADM listed around 253 countries currently, the different files formats are available along with shapefile such as Esri File Geodatabase, Geopackage(Spatial Lite), R(Spatial Polygon Dataframes), Google Earth .kmz and ESRI personal geodatabase. 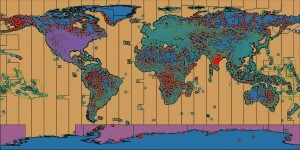 The coordinate reference system of each file is in longitude/latitude and the datum is WGS84. “Natural Earth is a public Domain Map data-set available at at 1:10m(Large scale data), 1:50m(medium scale data), and 1:110 million scales (Small Scale data).” Cultural, physical and raster category data can be downloaded from each scale. Data can be downloaded as shapefile (shp) or GeoDB or as SQLite. Natural Earth is maintained by Nathaneiel V. KELSO and Tom Patterson. Here is the screenshot of shapefile from QGIS (Quantum GIS) tool of 1:10m all shapefile layers uploaded at once. Geofabrik provides the current data from the Openstreetmap database, which is available either for free as well as premium shapefiles. Data can be downloaded as .osm and .shp.zip file. Select the continent from the link provided for which you need to download the data. Further you can either select the country for filtering out more and hit the .shp.zip link to download the data. This service is created by Jochen Topf and Christoph Hormann. Following data sets and its subcategories shapefiles can be downloaded from this website. a.) Coastline Data processing: It covers land polygons of the world area i.e continents and islands, Water polygon i.e polygon for ocean, seas and other water bodies and coastlines as line strings. b.) Generalized data sets: This section provides you to download Generalized coastline polygon shapefiles. c.) Antarctic icesheet: Antarctic icesheet polygons and icesheet outlines can be obtained from here. World data shapefile can be downloaded from GIS lab. 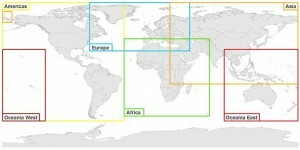 This global data are separated into 4 parts i.e Eur, Noa, Soa and Sas Zones, which you can see the image provided below. This data shapefile is in zipped with 7z compressor and all data are in Latitude / Longitude and WGS84 coordinate system. While the website does not look user friendly, you need to hunt over different country shapefiles at different area. Both free as well as paid Shapefile can be obtained and downloaded given. SocioEconomic Data and Applications Center provides data as zipfile of ESRI File geodatabases or shapefiles, and have decimal degree geographic coordinates system with datum WGS84 (world Geodetic System spheroid of 1984). Continent based regional data is available as shown below. Before downloading the data, you need to register and sign in to their system. If you are working on Sea or marine related subject, this website may help you to get the direct data to link to the relevant website from which you can get the shapefile maps data. It might be possible that the data which you might have downloaded from website provided here, can be of different format which was not required. For this, you can refer to following articles where you can convert different GIS data format to any of it. For United States – US census Data website. For European Countries – Euro Stat Data website. Is the above provided links are not fulfilling your need. Than the best option you can opt for is to create your own shapefile with the help of QGIS and openstreetmap. You can easily download the data from their and then edit it make it more clear according to your requirement. If you are new to QGIS then let me provide you some tutorial link which helps you to digitize the OSM data and create shapefile. For what purpose you need to download shapefiles? Which project you are working on? Which website you to get the map data? Do share your valuable thoughts by commenting below. I hope that the above list have definitely helped you in finding the right website to get free shapefile download, while their might be possibilities that I have not listed some of the website which should be present in the list. Please help us by providing those links by commenting below.